I am always amazed at how some people will crudely misrepresent the scientific literature in their efforts to pretend their particular political agenda is scientifically valid. The way they will dredge the scientific literature searching for studies they can quote and misrepresent seems an extreme form of cherry picking and confirmation bias. Surely those indulging in such crude literature dredging are fully aware of what they are doing. Here is an example of literature dredging I picked up recently. 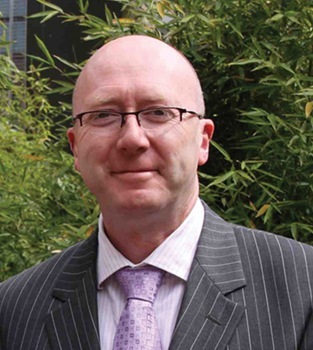 The offender is Michael Connett, Special Projects Director for Paul Connett’s Fluoride Action network (yes – a bit of nepotism there. Son Michael and Wife Ellen are on the payroll). Michael has a legal qualification, but no scientific qualification. Nevertheless, one of his special projects is a litrerature database anti-fluoride activists can use in their propaganda. Any and every scientific publication that can be quoted, misquoted or misrepresented in arguments against fluoridation. 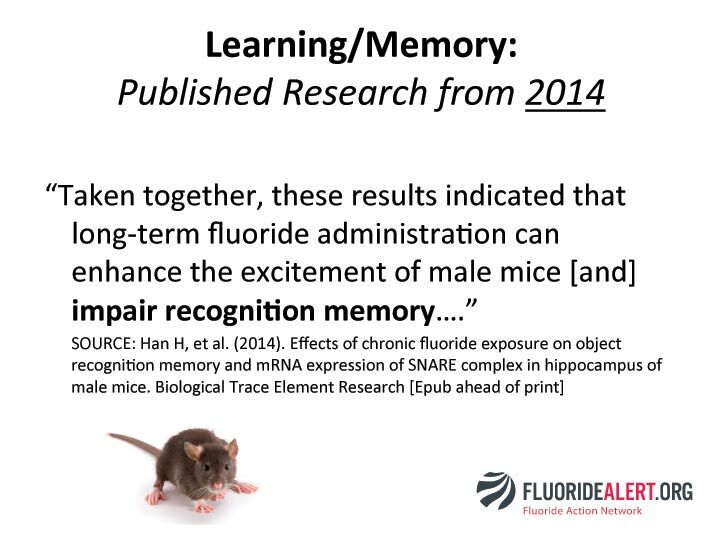 Here are a couple of slides from Michael’s talk at recent anti-fluoride get-together organised by the Connetts. 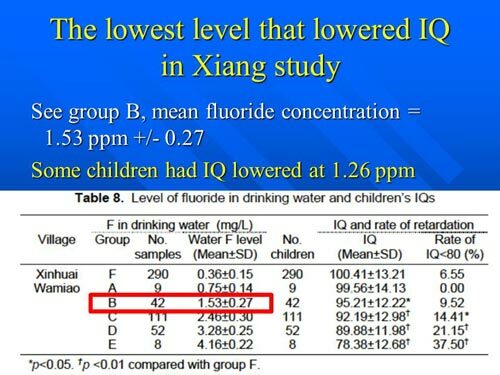 It’s about “Fluoride and IQ Studies” and the section was meant to show that recent research confirms community water fluoridation is bad for our brain. So he found 4 studies from on rats from 2014. 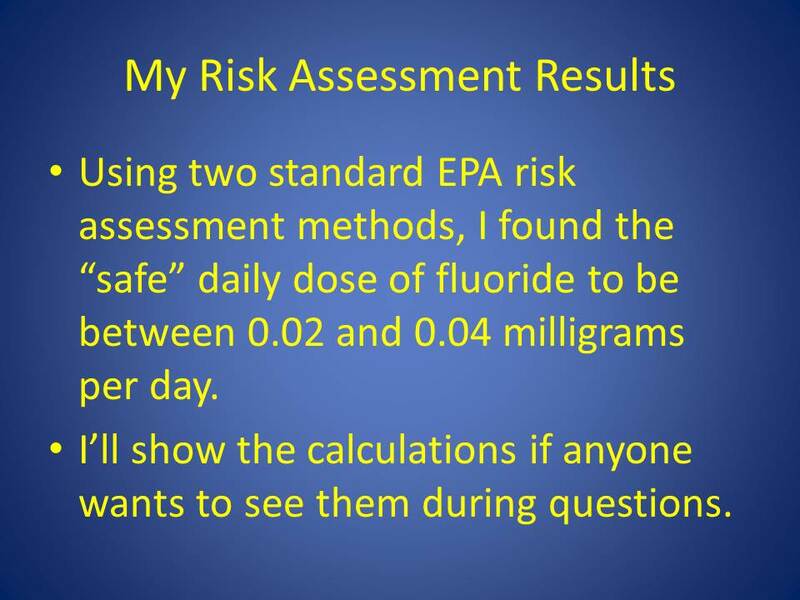 I have extracted from each cited paper details from the conclusions and the fluoride concentrations of the drinking water given to the rats. Keep in mind that in New Zealand the recommended optimum concentration for community fluoridated water is 0.7 – 1.0 mg/L. 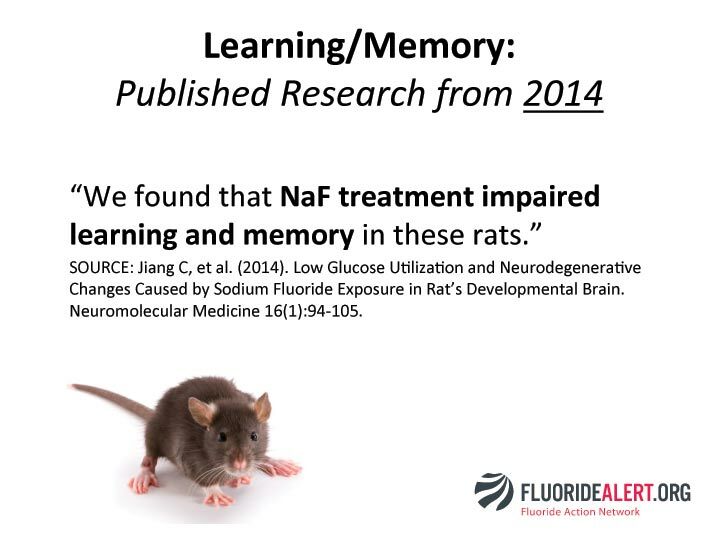 “We found that NaF treatment-impaired learning and memory in these rats.” The NaF treatments were 25, 50 and 100 mg/L! 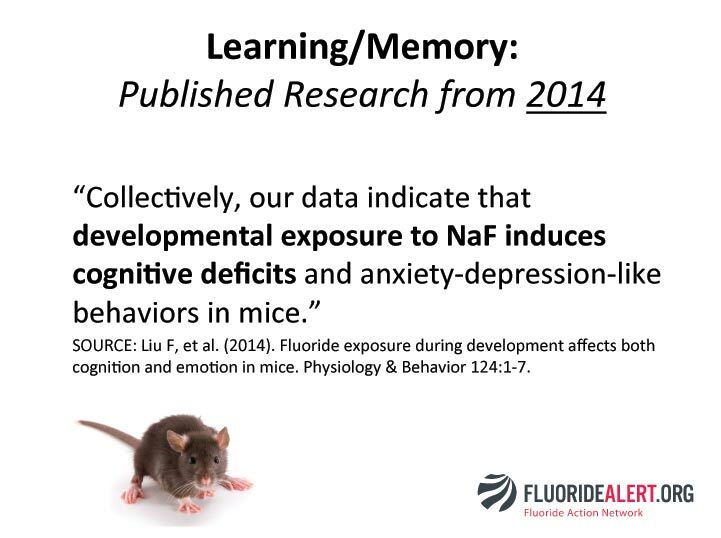 “these results indicated that long-term fluoride administration can enhance the excitement of male mice, impair recognition memory, . . ” The NaF treatments were 25, 50 and 100 mg/L! 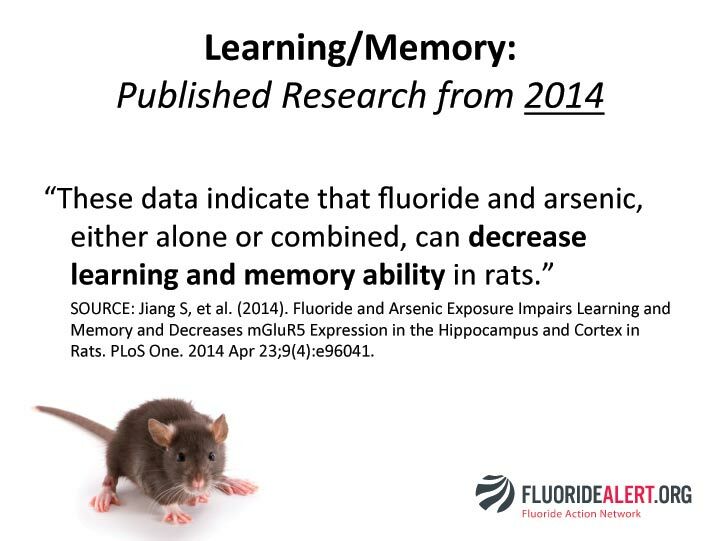 “These data indicate that fluoride and arsenic, either alone or combined, can decrease learning and memory ability in rats.” “The rats in the F, As, and F+As groups had access to drinking water with a 120 mg/L NaF solution, 70 mg/L NaAsO2 solution, and combined 120 mg/ L NaF and 70 mg/L NaAsO2 solution for 3 months, respectively. It’s the old story. Find evidence for adverse effects at concentration much higher the optimum and pretend the results apply to the optimum. Beware of political activists who claim their agenda has scientific support. There is a good chance they are manipulating the science. Surpise, suprise. 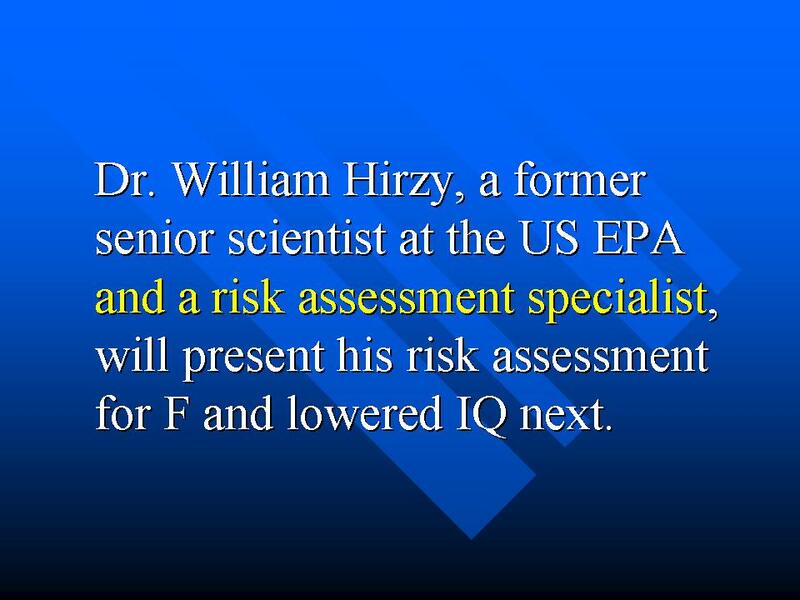 FAN has used young Michael’s talk at their get-together to launch a press release – Fluoride’s Brain Damage Studies Mounting. This will be sent through their usual social media merry-go-round in the hope that the MSM picks it up somehwere. Just what one expects from a political activist organisation.